With over 60 years in the field, Triad Magnetics has a long history of major innovations in the magnetics industry. From concert speakers in the 1950s and television electronics in the ‘60s, to spaceflight and microwaves in the ‘70s, Triad’s has a solid track record of setting new standards for performance and consistently pushing the boundaries of possibility in the industry. Over the years, we’ve developed considerable expertise in designing transformers, inductors, and power supplies for an expansive array of industries and applications. These efforts continue to this day with a selection of magnetics products designed explicitly for the renewable energy industry — including transformers for solar, wind, and water power generation — one of today’s fastest growing and changing sectors. Power generation, particularly when using renewable energy sources, can be a multifaceted process. The electronic systems that are required to collect renewable energy sources, convert those sources into usable power, and then measure inputs and outputs can be complex. Like any power generation applications, renewable energy generation applications have large scale requirements. This is especially true for large commercial operations — wind farms and solar farms, as opposed to residential rooftop solar arrays. Magnetics designed for renewable energy electricity generation must to be able to meet the high density, high power, and high frequency demands intrinsic to the industry. A great deal is riding on the shoulders of the renewable energy industry, which means that there is a lot of pressure on the sophisticated magnetic components with which those systems are built. Backed by more than half a century of industry leading experience, the engineering team at Triad is uniquely situated to meet these demands head on. Generating electricity with renewable energy sources is unique amongst industrial processes. Most industrial processes are mechanical in nature, only relying on electricity to function. Metal stamping, a common process, is a good example — though metal stamping machines are powered by electricity, their primary purpose of stamping metal is mechanical. On the other hand, renewable power generation — solar power generation, in particular — can be a fully or virtually fully electric processes. Renewable energy power generation products that use high quality Triad magnetics include smart meters, energy converters at every stage of distribution, power management systems, and control systems. Smart meters use high reliability coils, while our transformers and smart transformers can be found in use throughout the entirety of the system — inductors are used in control circuits, converters, inverters, power measurement systems, and more. Geothermal activity, biomass, strong winds, the sun, and fast moving water — these are the things powering the huge growth in the renewable energy industry. Magnetic components from Triad Magnetics, such as renewable energy transformers, are a major part of what makes such innovative energy use possible. 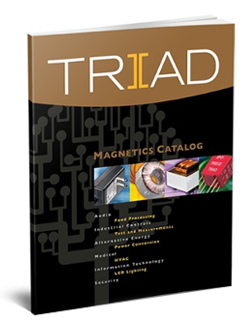 Our highly skilled engineering team, flexible manufacturing processes, and fully modernized testing laboratories all help to keep Triad’s magnetic products innovative and cutting edge, easily keeping pace with the industries we serve. To learn more about how our magnetics can support your next renewable energy project, contact us today.